I'm heading off to Great Falls again today, this time to attend the annual Montana History Conference. There was a time when I basically lived for events like this, but I confess I'm not really looking forward to it much today ... conference-going historians aren't all that much fun, and I think many of the academic ones have lost sight of what's truly interesting and important in their field. But regardless, it's an excuse for a roadtrip ... and that's always a good thing. And it also gives me an excuse to post some more Great Falls photos here -- like this rather unusual one. 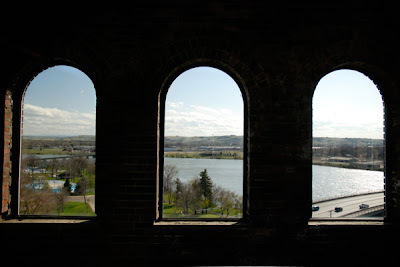 I shot this view of the Missouri River from the tower of the old Milwaukee Road passenger depot, probably my favorite building in the Electric City. Oh, that gives me a chuckle...this is going to sound rather stereotypical, and I don't mean to offend, but I just have a mental picture of quite a lot of bow ties and spectacles at a history convention. I once worked in a library, and served on a library board; librarians are an odd little bunch of people that take their job very seriously and are really pretty sheltered from the rest of the world. They are amusing to observe, and librarian jokes are very specific and dry. I hope your convention is a really good one, that you all get the opportunity to do karaoke, and that you remember to take your camera to THAT. About your picture...I've never been in that building, and I love the arched windows overlooking the river and the city! Great Falls is funny, coming from the Lewistown way, because we drive along through farming and BAM! we're in town. It's pretty abrupt. The age on those clerks is 60-ish, not 6-ish...drats; there's no editing a comment, once posted. Heh ... oh, no offense at all! I'm actually pretty hard to offend, and I have to say that your stereotype is closer to the truth than you might think. Tragically for me, historians don't know how to party in the least ... even getting some of them to go out for a quick beer afterwards was like pulling teeth. Sigh. And of course, a good number of the attendees were of retirement age. Very few young people there, which isn't surprising but is still distressing to me. Most people don't appreciate their heritage until they get older -- it's logical, I guess, but I never got it. I was a nostalgic fool even as a kid. I'm not organized in the least, either! It's a wonder that I get through life.